A fanatic of Brooklyn's Black Chocolate Stout -- I was pretty skeptical about their Dry Irish Stout. As good as Chocolate Stout is, and it's amazingly good, the alcohol clocks in at 10% a bottle while adding 300 calories. Fat and drunk is no way to go through life... or dinner. Dry Irish is a very dry stout. Bone-like, and if you like dry white Burgundy, Manzanilla Sherry or dry Scotch, you'll connect to this in a big way. I've never been a dry beer guy but this stout manages to deliver some decent mouth feel with each sip. Granted, it's not Chocolate Stout, but at 117 calories, that's seven more than Natty Light, it's a great compromise. At 4.2% alcohol it's considered a "session" beer. That's where you sit around with a bunch of guys, drink beer and tell lies for hours while staying sober enough to remember what you lied about. I've mentioned my friend in Florida who only buys beer on sale. It usually works out to porter and stout in Summer -- Pilsner and weiss during Winter. For the same reason, I'm hoping Dry Irish will go on sale this Summer. It's light enough for a basket of steamed Old Bay shrimp or a nice piece of grilled Salmon. 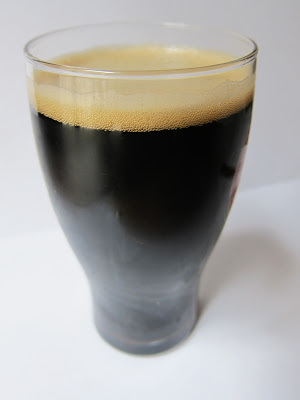 Stout enough for pulled pork BBQ or marinated flank steak. Here's where I usually tell you that, by being a contrarian, you can score this stuff for spit. Sorry. It's $12 a six pack. I can get a 30 pack of Natty Light in New Jersey for $15. Maybe someone's trying to tell me to drink less but better. Or, if you're coming over to my place...now you know what to bring. Beer enthusiast details found here. If you can find it up your way...try Straub's from St. Mary's Penna...a treasure...affordable and kind of unique. Well I guess I should not be shocked that you know this beer....I once drank about 1/2 a case at a deer camp near State College PA....up early the next A.M. and out the door to hunt with no discernable hang-over symptomatology...I was advised it is because of the lack of sugar in Straub's brewing process...a bonus attribute! You know that I know you know that being fat, drunk, AND STUPID is no way to go through life. So we're in the clear. Bonus! This mean friday belt might make a comeback? For a second there I thought you were talking Natty Boh. Very un-stout. Best consumed with oysters and dogs, far away from the yachting crowd. Always on sale. Thanks Tin. I'll check this out. One of my most memorable evenings was drinking too much Brooklyn Chocolate Stout with an Italian girl who could barely speak English. Caution: it gives a terrible hangover. The other was the night before I graduated. My roommate, a native of St. Mary's always had cases of Straub in the house. My stepfather, (a Liverpudlian, who some might say was as hard to understand as the Italian girl) and I stayed up all night drinking Straub the night before I walked. My mother was so pissed at us. Good memories. That is the finest description of a "session" beer that I've ever heard. Motion that. Spot on description of "session." This was only posted because you know that I'm avoiding grains, didn't you? Main Line- I liked the regular stuff but it really seemed to pack on the pounds. Couldn't stand the light. I hear they use corn flakes instead of grain. Ben - Around here, there's always someone who gets the Animal House references early in the comments. I suppose you know what that means? DB- I haven't seen Boh up here. Matthew- The Black Chocolate used to sneak up on me. A couple for dinner and pow! Straub is easy drinking stuff. Maybe too easy. That's a great story about your Dad. I've used this entire comment section to set you up...Try the Strraub...no grains. That looks sooo yummy! Can't wait to try some. "You may ask yourself, well, how did I get here?" "This Must Be Your Lucky Day"